Is the Louvre the Biggest Museum in the World? How Much Time Should You Spend Inside of the Louvre? When you go to Paris, everybody knows that you’re “supposed” to go and see this one very famous specific painting, in this one very famous specific Museum. The Mona Lisa. When people think about Paris, a couple of things come to mind: the Eiffel Tower and the Louvre Museum. Most of the people who go to the Louvre don’t have a personal reason to go visit. They are going because they’ve been told they should go. They run in and out, they stay for an hour, and then they go shopping in the mall underneath the Museum. But the truth is, if you are staying in Paris for a few days, you owe it to yourself to take the time to see some of the incredible art in the Louvre Museum. Give yourself at least a few hours there. 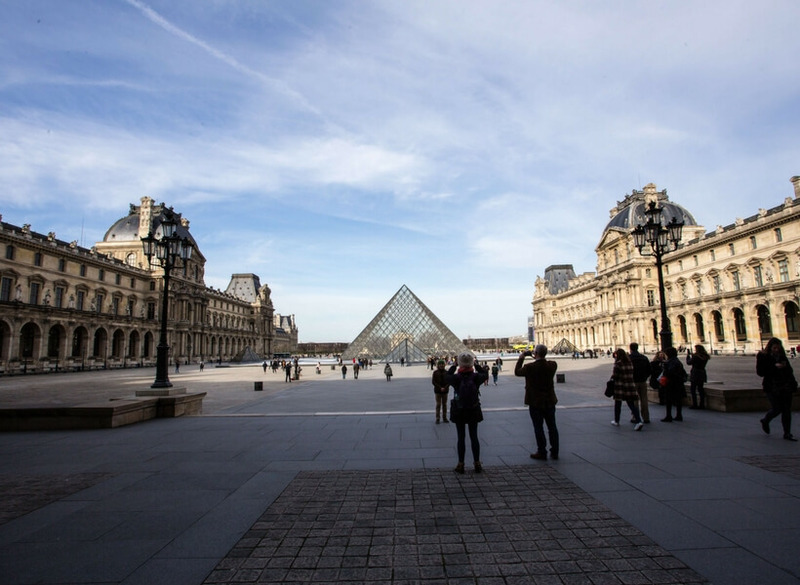 In this episode, we give you the game plan on how to enjoy the Louvre. It is widely said that the Louvre Museum is the largest museum in the world. It’s not. In terms of floor space, the Metropolitan Museum of Art is bigger. Some people even claim that the Hermitage Museum in St. Petersburg is the biggest museum in the world. The Hermitage Museum has the largest collection of paintings in the world. The Louvre has a more varied collection, but it is the most visited museum in the world. Almost 9,000,000 people per year visit the Louvre Museum in Paris. And it does feel like there are 9 million people in there every day starting at 10:30 AM which is why you must have a game plan. If you consider the Louvre in Paris, the Hermitage in St. Petersburg in Russia, and the Metropolitan Museum of Art in New York, the only one that was built to be the Museum originally is the Metropolitan Museum of Art. The Louvre building today has a very rich history that goes back very far. The building itself is an art piece. The Louvre was not built in one time period but rather over many hundreds of years. The main entrance level to the Museum is below ground now. We’ll talk about the three entrances that you can use and the difference between them later in the podcast, but it’s important to know that the main entrance is below ground today. In French below ground is called “sous-sol” (so on the elevators the button to get to the “sous-sol” will usually say SS). It doesn’t matter what entrance you use, all visitors enter the Museum in the same area below ground. There are galleries below ground as well. There are several levels above ground also. When you first arrive, you must go to the very large round information booth in the center of this underground entrance area; it’s situated underneath the very famous pyramid of glass. At the desk pick up a brochure. It will not give you detailed information about what’s in each gallery, but it will give you a map. This map will show all the levels and there is one in 20 languages so it doesn’t matter what language you speak you’ll find one that will make sense to you. This map will show you where the staircases are, where the elevators are (and there are now many elevators inside of the Louvre), it shows you where the bathrooms are. And unlike the Orsay Museum, the Louvre is now very user-friendly as far as access and bathrooms, etc. Annie was there with a person in a wheelchair and it was totally do-able. Sometimes you have to look for the elevators a little bit because it’s so large, but the map helps, and everybody is really helpful at the Louvre. The Louvre Museum can be a little bit overwhelming in terms of size, and not having any idea what to do and where to go once you get past the couple of things that you know you want to see, but don’t worry about that, it’s not difficult to navigate. If you have no time to go inside the Louvre Museum, at least go to the courtyard, go underneath the pyramid and look around that large entrance plaza underground. Just that is worth the 15 minutes you will spend. You do not need a ticket to do that. If you have no time to visit the inside of Louvre Museum, maybe you could go in the evening and enjoy the large courtyards above ground to look at the building itself because it’s absolutely fabulous. You can also walk along the southern wing on the outside which is along the Seine River and see how it’s lit up at night. On Wednesdays and Fridays, the Louvre Museum is open until 9:45 night, so you could do a late visit if you have a couple of hours. It would be a shame not to do even a quick visit to the Louvre unless you’re the type of person who is allergic to museums. But even for people who don’t like museums, there is something for them to appreciate inside of the Louvre Museum. You should know that the Louvre Museum is built along the River. And one of the things that visitors should do, aside from visiting the Louvre itself, is take a walk on the bank of the Seine River across from the Louvre, maybe rent a bicycle, may be get on the bus number 24 that you can get at Notre Dame Cathedral–you don’t have to do this because it’s walking distance–but if you’re not in the mood to walk you can take the 24 bus and just look outside the window so you can see the size of this building which is monumental. In general we recommend taking the bus rather than the Metro because you see more things that way. A very long time ago, in the 11th century the Louvre was fortified castle. At that time French Kings had a very small kingdom. It was pretty much the Ile de France which is the area right around Paris. And those French Kings built themselves a fortified castle surrounded by huge deep trenches with on one side the Seine River. If you go to the “Carrousel du Louvre” (you can get there from a street entrance no need for a ticket) you can see where they have fixed up a part of the fortification walls from times of Philippe Auguste who was the King at that time, with the trenches around it, and it’s very fun to see. And to give it some atmosphere, they took some classical Greek and Roman statues and placed them in that area (probably reproductions because they are in a zone that is totally unprotected) to give you an idea of the “ancientness” of the area. From the Louvre, the Kings of France moved to a place we talked about in episode 2 (joinusinfrance.com/2) of the podcast called La Conciergerie, and there was a step up from the fortified castle that is now part of the Louvre. They still kept the fortified castle as a defensive structure. Then in the 1400s and 1500s François I decided to modernize this fortified castle that was already 400 years old and he tore down everything but the base (which is why we still have the base) and had a part of the structure we built in Renaissance style. Renaissance style is brick and stone with high-pitched roofs. Little, Kings that came after François I both improved and added on to the Louvre Castle. The building was extended both going East and West along the River. Henry IV who was the King at the end of the 1500s and the beginning of the 1600s added another whole huge wing because of his wife. Henry IV had children with wife Catherine de Médicis (Caterina Maria Romola di Lorenzo de’ Medici), but he didn’t particularly like her. She had asked to have her own castle. She probably wanted to get away from him a little bit too. Catherine de Medici’s new castle was near the Louvre through the park called the Tuileries. Henry IV had a huge wing built on the eastern side with a large courtyard in the middle. So, now, you have this one point perspective from the Louvre through the Tuileries into the castle of the Queen (Palais des Tuileries). By the end of the 1600s the Louvre is pretty much as you see it today. There was also a wing added on in the honor of the Cardinal Richelieu who was a great friend of the Queens and had a great influence on the history of France. But despite all these wings added on at various times, the whole structure looks coherent. The style of architecture is what we call late Renaissance. 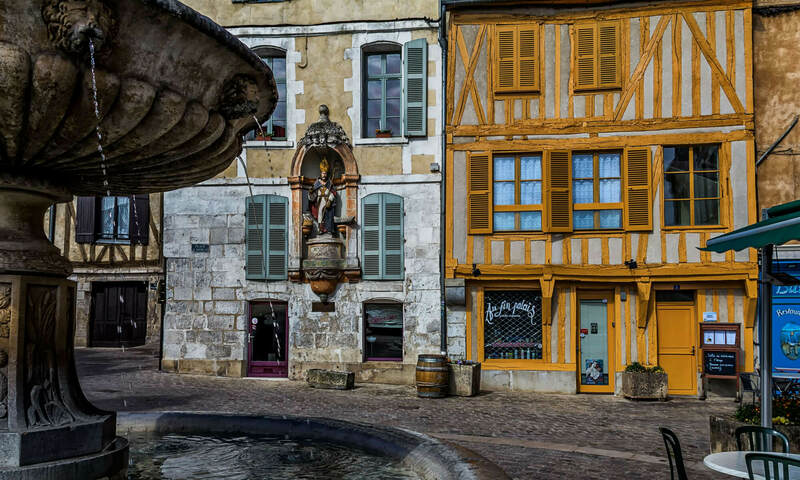 It’s very similar to other buildings built under Henry IV, such as on the Place des Vosges. What makes the story of the Louvre really interesting is that up until recently most museums in the world were the private collection of Kings and rich people, and it’s still the case sometimes. Here we have the Kings of France starting with François I, and very rich and important people, who start collecting art. Starting in the Renaissance, it becomes very fashionable to collect art. Art collections are built in one of two ways: you buy it or you take it. Buying art is a fairly modern concept. Thanks to the Italians in the Renaissance with their wonderful painters and sculptors who started to produce so much art that people in other countries (be they rich or noble) were able to start a commerce of art. So the Kings start to collect art from the middle of the 1500s on. By the time we get to Louis XIV (the great Versailles guy joinusinfrance.com/14) who is the great-great-grandson of Henri IV, he has made the decision that he does not want to live in the Louvre which is this old cold leaky building, and he is the one who officially changes the residence of the Kings of France to Versailles. Louis XIV also moves the whole court to Versailles. When Louis XIV moves out of the Louvre, the Louvre becomes a depot for all the collection of artwork, painting, sculpture, ceramic, furniture, he has no place for it all because the Château of Versailles is not finished yet. So for a long time the Louvre is a place where artists can go and use the space where they can also see all sorts of paintings and art etc. but nobody lives there anymore. The Louvre became a public museum right after the French revolution. But that is not when the idea of storing art in the Louvre began. It started in the 1740s. Louis XV lives and Versailles but he keeps collecting art. They are buying art, but if they do an expedition somewhere they are also taking art. So, they start collecting Greek and Roman statues and artifacts, Napoleon took a lot of Egyptian art. The French are certainly not the only ones who stole art all over the world, but we did it plenty. Somebody in the 1740s suggested that they should turn this huge building of the Louvre into a Museum, it was supposed to be the Royal Museum. It did not mean it would be open to the general public, but rather be open to a special part of the public; those people were part of the upper-class. So, part of the Museum would be turned into residences for artists. Then came Denis Diderot was the first person to write an encyclopedia. He was also an art critic. He wrote about art and culture and in the 1750s he wrote a document about how he thought the Louvre should be turned into a Museum and even included the idea that one day a week the Louvre could be open to the masses. Many people in Paris at the time were so poor going to see Royal Art collections would not have appealed to them, but there were also many who would have been interested. Diderot was a Renaissance man wanted to include everybody. The Royal collection included works that were paid by the taxes of the people. Up until that time there wasn’t a public museum anywhere in the Western world, they were all Royal private collections. And then we get to the French revolution. One day we will do a podcast about how the French Revolution changed French society. Most people know that the French Revolution started because the people resented the monarchy. Not because of the monarchy per se, but because people were being overtaxed. There was an abuse of power. People see the excesses of Versailles and of the art collections at a time when people were dying because they had nothing to eat, it did not go down very well. Like other buildings in Paris, the Louvre became a symbol of the disabuse of the monarchy. After all, part of this extensive Royal collection that was so big that the king could not put everything into this enormous Château of Versailles were stored in the Louvre, so by 1790 the building was taken over by revolutionaries. There was a sacking of the building; a lot of the paintings and the furniture were taken; some things were burned. But most of what happened is that things were stolen out of the Louvre and they were given to various people. It took a long time after the French Revolution for the government to find a lot of these works and buy them back. Yes they actually had to buy a lot of the art back. The 50-year-old idea of turning the Louvre into a public space did not go away even though the building symbolized the excesses of the monarchy. So, in 1792, right in the middle of the French revolution, the Louvre was declared a public Museum. However, it was not opened as a public Museum until 1794 because it had to be cleaned out. There had been squatters and there was a lot of work to be done before they could open it again. At first it was still going to be called the Royal Museum, but then the revolutionaries decided they liked the sound of the People’s Museum better (le musée du peuple de la Révolution). Napoleon started out as a revolutionary, he was a brilliant military officer, and he quickly decided that the revolution was not going the way he thought it should and instigated a coup d’état. Once Napoleon took over the French state he decided the Louvre should be named after him. So he changed the name of the Louvre Museum to the Napoleon Museum (this name didn’t stick too long), and when he went on expeditions to Greece and Egypt he took with him archaeologists, artists, and scientists. He created the doctrine that basically said that what you find is yours. So his military expeditions could take whatever they found, he decided that it was perfectly legal. Napoleon stole and took back to the Louvre enormous amounts of Egyptian sculpture, Greek statuary, and Roman statuary. In fact, he took everything that he could wherever he went. Then he brought it back and put it in this Museum that was called the Napoleon Museum for the time being. This went on from 1803 until 1815. Even in 1815 administrators of the Louvre were starting to say that maybe they should give some of the stolen art back. There was a period of 10 years when artifacts were indeed sent back to whatever they had been stolen from, with certain exceptions. They kept what they considered to be the best pieces from each of those collections. That is why today in the Louvre you can see Venus the Milo (a magnificent classical Greek sculpture), you can see the Winged Victory of Samothrace (going through a renovation right now), and also the Code of Hammurabi from Babylonia. The Code of Hammurabi is considered to be one of the earliest pieces of writing and it is in cuneiform. The Louvre offers really nice workshops for children where they get them to reproduce the famous work of art. Those workshops are all in French as far as we know, but they are really well done and children love them. The Louvre has adopted the attitude from the United States where they do a lot of outreach, educational and cultural programs. The Louvre today displays collections of the Kings from the 1500s; there are a lot of paintings, a lot of decorative arts such as Limoges porcelain and furniture that take up a whole wing of it in the Louvre. Starting in the year 1840 France had a minister of culture, and a department of antiquities, people in charge of historical monuments so all of a sudden there is a notion of the importance of cultural heritage of the country and of the gathering of everything they have in the Museum. They say there are over 35,000 pieces of art in the Louvre Museum and there are another 35,000 pieces that are not visible at any given time. Certain pieces they never take out because they are so essential, but other pieces they rotate so the public has a chance to see them at different times. Over time the Museum starts to buy works of art, the government also buys art to put it in the Museum and that’s the relatively new idea. During World War II the Germans occupied the Louvre just like they occupied every other major building in Paris, but the people who run the Museum had the foresight starting in 1935 to hide major pieces before the German invasion. The strategy was to hide art in the countryside and disperse it in many different places. As you can see if you read or watch The Monument’s Men the Germans also stole a lot of art. The Germans found certain things that came from the Louvre, but not everything. The Louvre was not emptied completely as a precaution, but all the major pieces that the Germans would have liked to take were moved out. This did not make the Germans very happy. But the Germans were able to take a lot of art from other places anyway. A lot of it was found and luckily brought back. The Louvre has become a symbol of art in France and it is one of the places that you must see. There are two very important wings in the Louvre: one is the Italian paintings wing. King François I was a passionate fan of Italian Renaissance art. This is why the Louvre has the Mona Lisa (La Joconde). François I bought the Mona Lisa from Leonardo da Vinci who came to live in France as an old man and who died in France and was buried in France. The collection of Leonardo da Vinci paintings in the Louvre is one of the greatest outside of Italy. Everything you will see in the Louvre was produced before 1848. This has to do with Louis Philippe who was the last Republican King. The Orsay Museum (joinusinfrance.com/15) picks up the art after 1848. What doesn’t the Louvre have? Not much that was produced before 1848. In the Louvre you will see northern European painting, French painting, Italian painting, and Spanish painting. Your will see Rembrandts, Vermeers, Goyas, Velasquez, and too many Italians to name. It is like going into a candy store! There are also hold wings of the Louvre dedicated to sculpture and they are not as crowded. There is a very large section of ceramics. The Egyptian wing is absolutely to die for: there are sarcophagi, massive sphinxes, and old structures. And the Egyptian wing is a wonderful place to take children to because they like to walk around and see the volume of the art. They also have a recently redone section on Islamic art which is strange because Paris also has a whole Museum dedicated to Islamic art. But in the Louvre it’s basically the history of Islamic art. They also have wings with drawings and engravings. 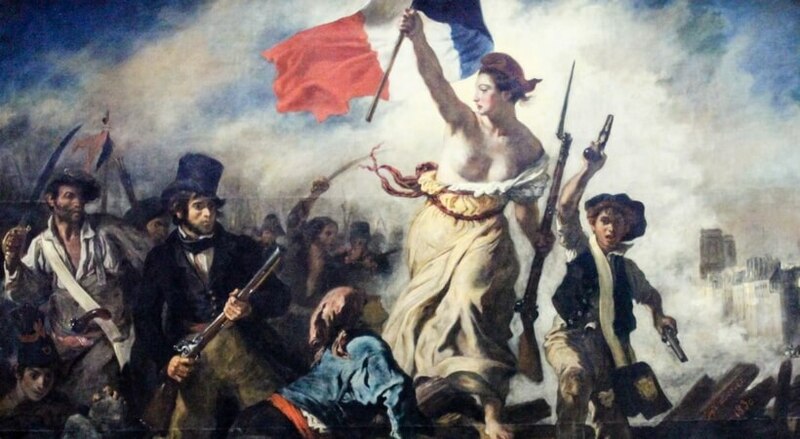 Annie enjoyed the paintings by Delacroix, “La liberté guidant le people” for instance. Rubens was also a very important painter. He was commissioned by Catherine de Medici to do a series of gigantic paintings that tell the story of her life, of getting married to Henry IV and of having her son, the man who became Louis XIII, a King who was very important to the history of France. These paintings were commissioned by her to go in her palace, the Palace of Luxembourg and they are now in a special gallery inside the Louvre. There are rooms that always have a few people but are never very crowded. Not every room in the Louvre has benches, but these do, so you can sit and contemplate the quality of the painting and the history that it tells. There truly is something for everybody inside of the Louvre. They also always have temporary exhibits. Occasionally they invite a contemporary artist to go in and choose some works from the collection and curate his or her own exhibit out of the collection. Those are fun to see because you can see how a contemporary artist thinks in relation to works from the past. Everybody wants to see the Mona Lisa, so it doesn’t matter when you go it’s going to be crowded. There are going to be 10 busloads of tourists in front of you. 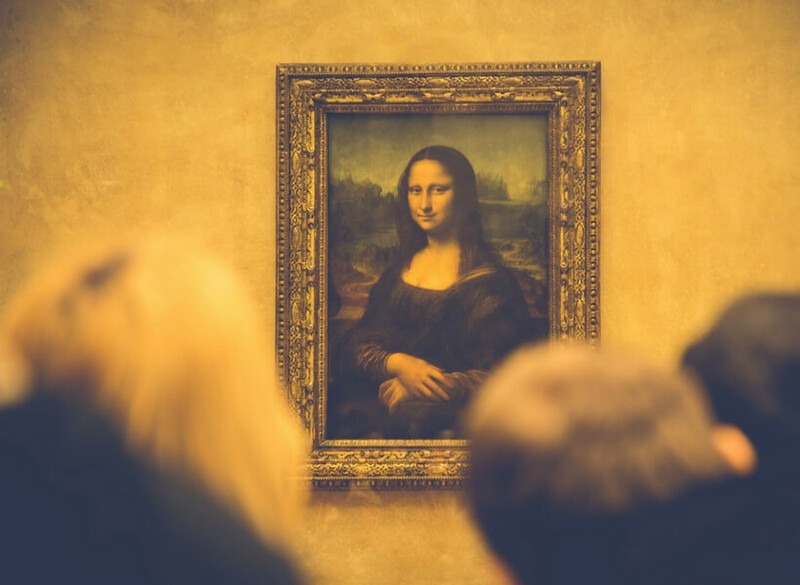 The Mona Lisa happens to be a relatively small painting, so if you’re standing 20 m away you will not see very much. The Mona Lisa is protected very well behind thick glass, it is lit well also, but with that many people wanting to see it, you do not get to stand there and gawk. So if it’s a busy day, maybe you should skip it. But it’s very hard for people to skip it because people like to take a picture of the Mona Lisa with the phone as proof that they were there. The Louvre is the most visited Museum in the world. It is closed on Tuesdays. On Wednesdays and Fridays it stays open until late. It opens at 9:30 in the morning. Whenever you go, there will be people there. There are parts of the Museum that are much more crowded than others. Italian paintings and the Mona Lisa are always crowded. There are three entrances you can use to go into the Museum. One is underneath the pyramid, the second is in the carousel du Louvre and third is called “Porte des lions”. E.M. Pei is a Chinese American architect who designed the pyramid for the Louvre. The pyramid opens in 1986. They added it to create a new entrance into the Museum. They also did a lot of renovation work on the inside of the Louvre at the same time. They added elevators, escalators, bathrooms, cafés, and also air-conditioning to a lot of the Museum. They created a large open space as the entrance to the Museum. There are three major wings to the Museum. You can go from one wing to the other on the upper floors mostly. With this renovation, they created a new entrance Plaza underground and the pyramid sits on top of the entrance. Even though the pyramid is very modern in style, it goes very well with the rest because it does not overwhelm, it’s not as high as the buildings. If you have time, and if you don’t get their peak hours, it’s best to enter the Louvre from the pyramid, because it’s a fun thing to do. You can use the escalators, or they have a really cool circular elevator, there are two wading pools outside. The way to avoid lines is to buy your tickets ahead of time. These are not timed tickets, these are day tickets. You can buy those tickets online, or you can go to a FNAC store, they are all over Paris and France. There’s one line to buy the tickets, and a different (much faster) line to get into the Museum. However, if you cannot get to the Louvre by 10 o’clock in the morning, we suggest that you do not go there until 1 o’clock in the afternoon when the lines are usually shorter, or you wait until 6 o’clock at night. There are vestibules; you can check your coat and your luggage. You have to get the map, and then decide where you want to go. There are also vending machines for Louvre tickets inside of the main entrance Plaza under the pyramid. It is worth trying if the line isn’t too long. Some foreign cards will not work in French vending machines, but it’s worth a try. Three hours is adequate, four hours is better. That is will give you time to look at the art, stop for coffee somewhere, use the bathroom once. But for this to work, you have to select to wings that you want to visit. Choose the two sections that you are the most interested in, and go to those sections. Do not try to visit even half of the Museum. Even in one full day you cannot do that. There are people who run from one piece to another just so they can take a picture and say look, I was there. We suggest you either get there early or wait until later in the day on the days when it’s opened late which are Wednesdays and Fridays. But it is best to buy your tickets ahead of time. Tickets are €12 for the permanent exhibit and €16 if you want to see the temporary exhibits. There’s a big cafeteria inside of the Museum as well as several cafés. French painting, Italian painting, Northern painting, Egyptian art are the most crowded wings of the Louvre Museum. Let’s imagine you want to see paintings. You need to go to the Denon wing. That’s the wing you go to want to see the Mona Lisa. There are arrows that you can follow straight to the Mona Lisa. It’s up some steps, when you go through Roman sculpture, and then you go up more steps and more sculpture. Just you go inside the Museum walk all the way to the Mona Lisa and back out would probably take you one hour. You don’t get to the Mona Lisa directly. First you go through Greek and Roman sculpture, you go up the steps, you turn to the right, that takes you to Italian painting, then you go through two or three rooms of the earliest Italian painting, then you walk down this huge galleries, and then it’s a few more doors down, and then you turn to your right and you’re in this enormous room. In this large room you will see on both sides beautiful examples of Renaissance art, and in the center of the room behind thick glass and cordoned off you have the Mona Lisa. The Mona Lisa is probably 40″ x 60″, it’s not very large. The reason why it’s behind glass is that some crazy person slashed it in the early 80s. She used to be unprotected with no glass on her like most of the other paintings in the Louvre, but they realized that they needed to protect it. Everybody takes pictures of her even with flash which does not work. On the other side of the Mona Lisa is this very large beautiful painting by Veronese called the Marriage of Canaan. If you go to see the Mona Lisa only, you have to walk through all this other painting. You will not get there fast. Photography is allowed inside of the Louvre Museum turn your flash off. It is good to get an audio guide. One of the entrances is called the carousel. If you take the number one Metro line and get off at Louvre Palais-Royal, you will exit across the street from the Louvre Museum, you cross the rue de Rivoli, you walk a little bit to the right, and that’s where you’ll see the sign that this Carousel. You go down the escalators and you find yourself in the shopping center. It’s a very good shopping center where you will find jewelry, clothing, chocolate shop, electronic shop, Museum store, a food court, a couple of Starbucks, a post office, bathrooms. This shopping center is completely underground, and it will connect you to the Louvre entrance. That’s where you can see the Philippe Auguste old wall and the inverted pyramid. That’s also one of the places where you can go through security. There’s also a very large and very nice bookstore in that area. The food court in the Carousel is also interesting because it’s more international. Once you the ticket, you can be in and out of the Museum, but you will have to go through security again. Porte des lions. It’s at the eastern end of the Museum on rue de Rivoli. It takes you into the Cour carrée. This entrance is never crowded because most people don’t know it’s there. Sometimes individuals can go through that entrance, but it’s not what it’s for. The Louvre is an experience. Everybody has different tastes so it’s impossible for us to tell you this is what you should see, this is what you should do. But this is a way of dealing with this large Museum and giving yourself a chance to appreciate the wonderful art there.